If ever it was possible for an opening scene to buoy an entire feature-length motion picture, The Iron Lady would be it. Having wandered away from her London home and past her caretakers, a senile, octogenarian Margaret Thatcher (Meryl Streep) is shopping in a small corner mart. As loud Indian music blares over the loudspeakers, a besuited businessman pushes past her while yammering into his cell phone; a young black customer in headphones faintly rolls his eyes at the doddering old woman. There’s irony when Thatcher – a middle-class grocer’s daughter – does a double-take when told that a pint of milk costs 49 pence. No one recognizes the iconic Cold Warrior, but what’s more, it is a world she no longer recognizes. It’s a biting collage of class and culture as brilliant as anything Stephen Frears has ever filmed. Off this lofty perch, however, falls the rest of this biopic from director Phyllida Lloyd (Mamma Mia!) and screenwriter Abi Morgan (co-writer of Shame). Told in flashback rote, the narrative oscillates throughout from the present-day senescent Thatcher to her early days as an ambitious Oxford grad with an eye and gut for politics. 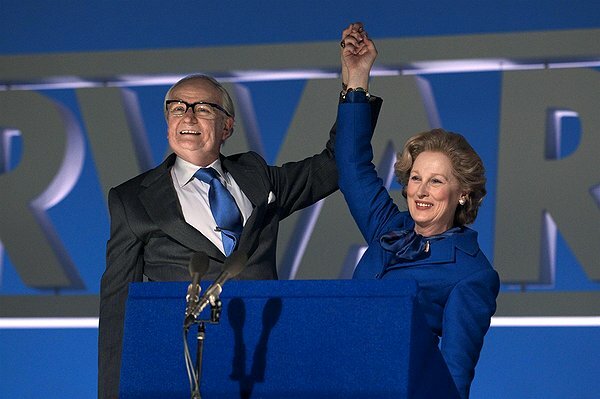 The nee Miss Roberts (portrayed by Alexandra Roach) falls for and marries Denis Thatcher (played as a young man by Harry Lloyd), but only after he agrees to abide by her political ambitions. From there, it’s off to a whirlwind of biographical touchstones: Thatcher (now played by Streep) being elected to Parliament in 1959; unseating Edward Heath as leader of the Conservative party; her accession to England’s first female PrimeMinister in 1979; her 11-year reign, highlighted by trade union strikes, IRA terrorism and, of course, the Falkland Islands conflict; and being deposed as party head in 1990. The film’s true iron lady is Streep. Her role is susceptible to suspicion as it blatantly contains all three ingredients of the Oscar formula – British, biographical and disability-centric (in the case of the latter-day Thatcher). However, Streep’s depiction goes well beyond mere impersonation, ably portraying Thatcher at both her most harrowing and heroic. She essentially plays two different characters and does so with trademark subtlety and sublimity. At a dinner party hosted by the elder Thatcher, a guest asks how she would handle a recent terrorist attack were she still in office. Streep pauses, the question seemingly evaporated before reaching her blank countenance, before suddenly summoning, as if by instinct, a cogent diatribe against the evil of modern-day global terrorism. While Ms. Lloyd hits all the historical high notes, the fragmented narrative and stunted 115-minute running time doesn’t afford the opportunity to flesh out any context. We’re subjected to constant news reports about IRA bombings – including the murder of Airey Neave and the 1984 attempt on Thatcher’s life at theBrighton hotel – but little about their cause and effect on Thatcher’s policies. Her decision to engage in the Falklands is chalked up to a steadfast nationalism and adherence to principle that guided every aspect of her life. However, in a more enterprising (and perhaps honest) script, Thatcher would recognize and, indeed, shrewdly exploit the popularity that comes from being a wartime leader, particularly a female one. How Ms. Lloyd ignores any juxtaposition with Elizabeth I mounting a grey gelding to address the troops at Tilbury is beyond me. More problematic, however, are the director’s incessant returns to the dementia-suffering Thatcher, staring into mirrors and being regularly visited by the apparition of her now-deceased husband, played by Jim Broadbent, who essentially acts as a one-man Greek chorus. Beyond the precious time squandered at the expense of Thatcher’s time in office, these scenes posit her relationship with Denis as the guiding force in her life. This belief, while in keeping with the accounts of her daughter Cathy and other confidants, is not developed throughout the rest of the film. Moreover, there’s a dissonance between Mr.Lloyd’s demure, wealthy young aristocrat and the daft Denis (both before and after his death) whom Broadbent channels – it actually took me a few minutes to figure out they were the same character. As part of a makeover to make her appear more commanding to the public, the future Prime Minister participates in a bizarre speaking exercise straight out one of the therapy sessions in The King’s Speech. Unlike Margaret Thatcher, unfortunately, The Iron Lady never finds its true voice.